More than a century since one of the most remarkable scientific objects of antiquity was discovered, experts are hoping to reveal more secrets of the deep using the latest in diving technology. Greek and American archaeologists are returning to the ancient shipwreck of Antikythera using the Exosuit – a state-of-the art, deep sea diving suit – that will let them dive to more than double the depths of previous expeditions. 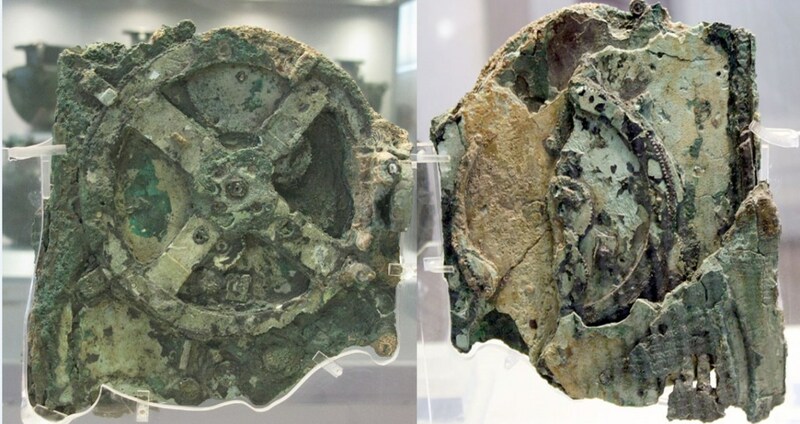 Here, the so-called Antikythera Mechanism, a 2nd-century BC device dubbed the world’s oldest computer, was discovered by sponge divers in 1900 off the remote Greek island. The Exosuit (pictured) built in Canada by Nuytco Research, lets divers reach depths of 492ft (150 metres). It is made of aluminium, with 18 joints in the arms and legs. It also has four 1.6 horsepower thrusters on the back to help the diver move around underwater at relatively high speeds. The highly complex mechanism consisting of up to 40 bronze cogs and gears was used by the ancient Greeks to track the cycles of the solar system. It was so advanced, it took another 1,500 years for an astrological clock of similar sophistication to be made in Europe. The Exosuit, built in Canada by Nuytco Research, lets divers reach depths of 492ft (150 metres). It is made of aluminium, with 18 joints in the arms and legs. The suit is able to supply oxygen for up to 50 hours, and maintains communication with the surface via an optical cable. It also has four 1.6 horsepower thrusters on the back to help the diver move around underwater at relatively high speeds. Each suit weighs between 35 (226kg) and 42 stone (272kg). Prices start at around £360,000 ($588,000). Now archaeologists returning to the wreck will be able to use the Exosuit to more than double the depth they can dive at, and stay safely at the bottom for longer. The Exosuit, built in Canada by Nuytco Research, lets divers reach depths of 492ft (150 metres), while still performing delicate tasks, said archaeologist Theotokis Theodoulou. Up until now, divers had only been able to operate at a depth of 196ft (60 metres). The suit, which makes the wearer resemble Buzz Lightyear, ‘expands our capabilities’, continued Mr Theodoulou, and ‘I’ll be able to grasp, pluck, clench and dig… for several hours,’ he added. Archaeologists believe many other artefacts are yet to be discovered in and around the wreck. The Mechanism was found with a bronze statue of a youth in the wreck of a cargo ship apparently carrying booty to Rome, and researchers are certain that other items on board still remain to be discovered. ‘We have good signs that there are other objects present,’ said Angeliki Simosi, head of Greece’s directorate of underwater antiquities, after exploratory dives in the area in 2012 and 2013. ‘There are dozens of items left, this was a ship bearing immense riches from Asia Minor,’ added Dimitris Kourkoumelis, another archaeologist on the team. The Mechanism (pictured) was recovered from a Roman cargo shipwreck off the Greek island of Antikythera. Previous studies have shown it was used to chart the movement of planets and the passing of days and years. Scans in 2008 found that it may also have been used to predict eclipses. The archaeologists also hope to confirm the presence of a second ship, some 820ft (250 metres) away from the original discovery site. Antikythera, which now has a population of only 44, was on one of antiquity’s busiest trade routes, and a base for Cilician pirates, some of whom once captured and held the young Julius Caesar for ransom. He later had them all captured and crucified. The Greek team is assisted by Brendan Foley, a marine archaeologist from Woods Hole Oceanographic Institution at Massachusetts, which was involved in a dive to the wreck of the Titanic. Foley has helped in outings to identify ancient shipwrecks over the last five years. Antikythera (highlighted) which now has a population of only 44, was on one of antiquity’s busiest trade routes, and a base for Cilician pirates, some of whom once captured and held the young Julius Caesar for ransom. He later had them all captured and crucified. The Mechanism was recovered in 1900 from the Antikythera wreck – a Roman cargo shipwreck off the Greek island of Antikythera. It was discovered in a wooden box measuring 13 inchesx7 inchesx3.5 inches (340×180×90mm) and consists of bronze dials, gears and cogs. A further 81 fragments have since been found containing a total of 40 hand-cut bronze gears. The mechanism is said to have been created in around 100BC, and is believed to be the world’s oldest calculator. Previous studies have shown that it was used to chart the movement of planets and the passing of days and years. Scans of the mechanism in 2008 found that it may also have been used to predict eclipses, and record important events in the Greek calendar, such as the Olympic Games. The scans also revealed the mechanism was originally housed in a rectangular wooden frame with two doors, covered in instructions for its use. At the front was a single dial showing the Greek zodiac and an Egyptian calendar. On the back were two further dials displaying information about lunar cycles and eclipses. The calculator would have been driven by a hand crank. The mechanism recorded several important astronomical cycles known to the Babylonians hundreds of years before that help predict eclipses. These include the Saros cycle – a period of around 18 years separating the return of the moon, Earth and sun to the same relative positions. The device could track the movements of Mercury, Venus, Mars, Jupiter and Saturn – the only planets known at the time, the position of the sun, and the location and phases of the moon. The researchers have been able to read all the month names on a 19-year calendar on the back of the mechanism. The month names are Corinthian – suggest that it may have been built in the Corinthian colonies in north-western Greece or Syracuse in Sicily. The device was created at a time when the Romans had gained control of much of Greece. The Mechanism is on display at the National Archaeological Museum in Athens. ‘We may find one or more monumental statues that were left behind in 1901, in the mistaken belief that they were rocks,’ Foley said. As well as the new Exosuit, the Antikythera expedition will also use robot mapping equipment and new advanced closed-circuit ‘rebreathers’, which will allow divers much more time underwater. ‘We will have more bottom time than any previous human visitors to the site, because we dive with mixed gas rebreathers,’ the expedition’s websites said.